CareersinAuto.com launches new feature to match 8 million auto employees with the integration of LinkedIn. 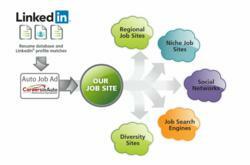 The new feature will allow auto employers to benefit from a wider reach of talent with 200 Million LinkedIn profiles. With more than 8 million American families that depend on the auto industry, we believe that when employers need talent, they should get talent. It's no secret that auto job seekers are frustrated when searching for auto jobs. Keyword search was designed to find documents, not people. CareersinAuto is changing that for the auto industry with their real time matching technology (similar to online dating sites) designed to find people. The new additions include the integration of the LinkedIn™ user database with the Auto Talent Reach™ resume database, enabling hiring managers to automatically tap into a pool of 200 million LinkedIn profiles without the need to search for them using keywords. The new feature enables hiring managers to enter their LinkedIn credentials and immediately see LinkedIn profiles and resumes from their network that match with the jobs they posted. The software grades and ranks resumes for the hiring managers saving them significant amount of time. CareersinAuto now offers additional auto job posting through Facebook and Twitter. "The CareersinAuto advertisers are experiencing 7% – 10% viral lift from user interaction with social media and can now provide almost an unlimited access to the US talent pool," says Patrick Antrim, Founder and CEO of CareersinAuto.com. "With more than 8 million American families that depend on the auto industry, we believe that when employers need talent, they should get talent. We also believe hiring can be easy and recognize that social media is a great place to reach auto professionals. We just made it easy for auto employers to benefit from it." Job seekers who use CareersinAuto.com can instantly share available jobs with fans and friends on social networks such as Facebook, Twitter, and LinkedIn thus driving additional exposure for advertiser job postings. CareersinAuto.com provides recruitment solutions to the automotive industry. CareersinAuto provides auto employers a broad reach to local media players such as newspapers, radio and TV stations, universities and local portals. Such campaigns reach tens of millions of job seekers on the Internet and result in significantly better response to job ads. CareersinAuto.com offers its advertisers Auto Talent Reach™ - a unique technology that intelligently matches between job seekers and employers, allowing them to find each other and to communicate in a dramatically more efficient manner.